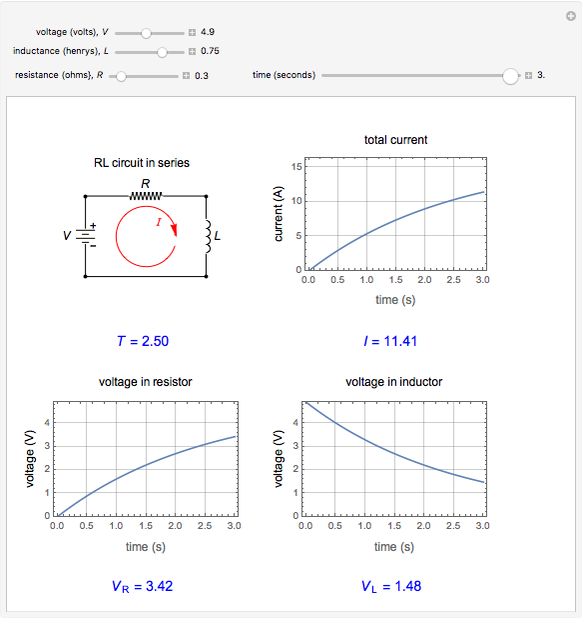 This Demonstration shows the time dependence in a RL circuit of the current, voltage across the resistor , and voltage across the inductor . The selected variables are the DC voltage of the source , the resistance , and the inductance . We derive the equations: , , and . You can observe their changes as you vary the time . 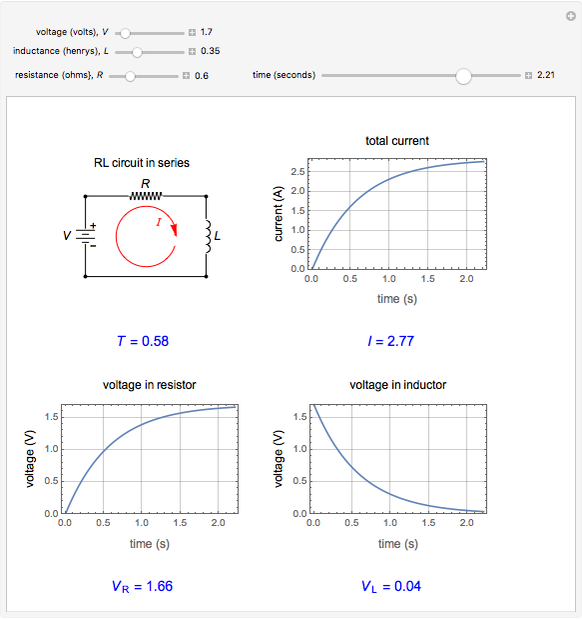 We also compute the time constant for this RL circuit: . 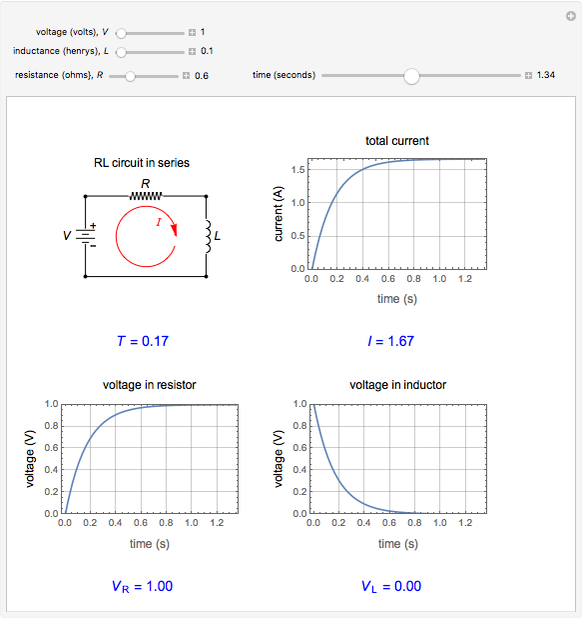 This simple RL circuit is composed of a voltage source, an ohmic resistor, and an inductor. The voltage is expressed by the equation , where is the voltage across the voltage source, is the voltage across the resistor, and is the voltage across the inductor. According to Ohm's law, for any ohmic resistor, is equal to , where and are the current and resistance through the resistor. 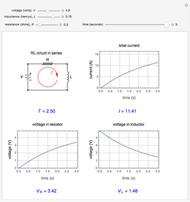 Current passing through an inductor causes magnetic flux, resulting in inductance. The inductance is defined by , where is the magnetic flux created by the current and is the current through the inductor. Rearranging the terms gives , which shows that any change in the current creates a change in the magnetic flux. According to Faraday's law of induction, a change in magnetic flux creates an induced voltage, represented by . The negative sign comes from Lenz's law, which says that the induced voltage in an inductor always opposes the change in current. Thus, we can replace and in the equation with and , giving . R. A. Millikan and E. S. Bishop, Elements of Electricity, Chicago: American Technical Society, 1917. (Jun 3, 2016) books.google.com/books/about/Elements_of_Electricity.html?id=dZM3AAAAMAAJ. E. M. Purcell and D. J. Morin, Electricity and Magnetism, New York: Cambridge University Press, 2013. (Jun 3, 2016) books.google.com/books/about/Electricity_and_Magnetism.html?id=A2rS5vlSFq0C. Bruce Liu and Mark Guo "RL Series Circuit"